May Day 2018: Fight the billionaires and their bigot politicians | Fight Back! This year, International Workers Day on May 1 is important for the labor and immigrant rights movements. For over a year now, the people have faced an onslaught of attacks from President Trump’s right-wing administration. Trump’s White House wants to enact the agenda of billionaires and bigots at all costs, whether through tax breaks for the rich, or through cruel raids and deportations of immigrants that rip families apart. As soon as Trump took office, people started fighting back. 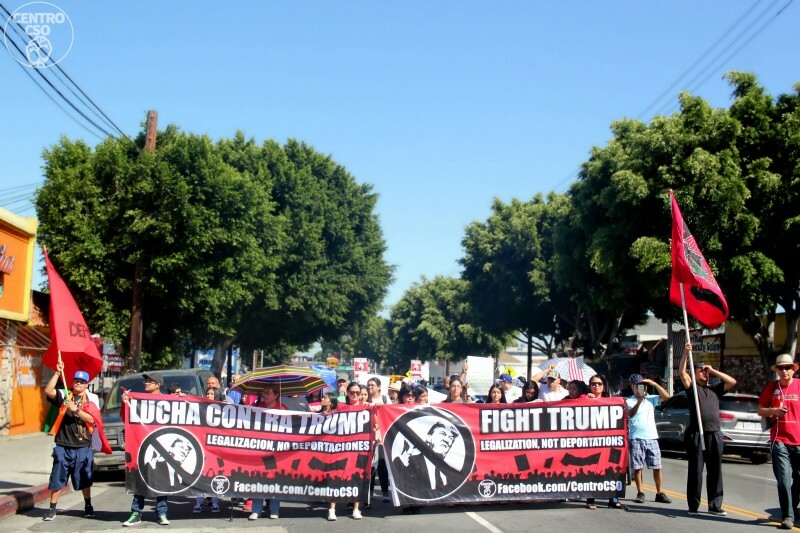 We in the Freedom Road Socialist Organization call on workers, immigrants and oppressed people to make this year’s May Day an extraordinary moment of resistance by marching and protesting against these attacks. A holiday for unity and struggle! International Workers Day was born in the USA. Forced to work long hours for low wages, workers across this country, many of them immigrants, marched by the hundreds of thousands on May 1, 1886. They demanded an eight-hour workday. This massive showing of worker power shook the ruling capitalist class. The bosses turned out police and anti-union strikebreakers to physically attack workers. Eight strike leaders were framed up and jailed. Four were hung - the Haymarket Martyrs. Like Trump today, the politicians used anti-immigrant rhetoric and red-scare tactics. The executions sparked worldwide outrage, and workers in many countries won the eight-hour workday. Inspired by the Martyrs of Chicago, May 1 became International Workers Day! Bosses and politicians tried to erase May Day in the U.S., but it took on new life in 2006. 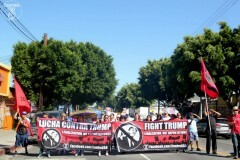 Chicanos, Mexicanos, Central American and others packed the streets for the May 1 mega-marches. In Chicago, Los Angeles, Milwaukee and nearly every city, millions marched for immigrant rights and demanded legalization for all. Marches will continue this year. Unleashing ICE, Trump has ramped up deportations and workplace raids, like the raids targeting 7-Eleven stores that detained 400 workers. Trump also stripped Central American and Haitian refugees of their Temporary Protected Status (TPS). Then Trump overturned the Obama-era DACA executive order, threatening those brought to the U.S. as children. While bridges collapse, and walkways fall, Trump promises to build a useless wall. Trump continuously misrepresents and attacks the Diversity Visa, which allows 50,000 people to immigrate, half from African countries. No surprise from a bigot who claims President Obama is a foreigner, ran false advertisements framing the Central Park Five, and complains white supremacists are treated unfairly. Now the Trump administration is gearing up to attack the unions. This year, the ruling class hopes to deal the labor movement a body blow. The Supreme Court is expected to rule against public sector unions in the landmark Janus v. AFSCME case. The ruling is expected to encourage the none payment of union dues. The ruling will totally ignore that the majority of workers democratically voted for the unions and contracts in their work places. Teachers win strike! People are fighting back! All is not lost however! Last year more people took part in protests than ever before, and in West Virginia teachers and support-workers just won a strike. They shut down the entire state’s public school system for nine days. The strike won a 5% pay increase and a temporary halt on politicians plans to cut health insurance. The teachers proved that by stopping work and building solidarity, it is workers - not laws drawn up by the 1% - that have real power. Teachers in other states are already learning the lesson. Immigrants too have stood up to the ruling class’ attacks in the Trump era. DACA recipients and immigrant rights activists are waging a campaign of civil disobedience pressuring Congress to pass a Clean DREAM Act and end deportations. Others are fighting for sanctuary areas free of ICE raids. In many cities, African Americans, Chicanos and others are continuing their fight to jail killer cops, to free those who were tortured and framed, and for community control of the police. Trump can verbally abuse this movement, and insult those who kneel during the national anthem, but the struggle for justice and equality will triumph. Workers and oppressed people unite! This year’s May Day will see a good number of demonstrations by immigrant rights groups, unions and others hoping to build our fightback. Some voices want us to place our faith in politicians and talking heads to stop Trump’s agenda. We think the most effective resistance is in building the people’s movements – in the streets. As Trump exposes the naked greed and brutality of the U.S. system of capitalism for the world to see, working people - especially young people - are looking to alternatives. They are beginning to favor socialism over capitalism, and are increasingly willing to fight for it. Under capitalism, the ruling class of billionaires, with their banks and corporations, hold political and economic power. Trump is their brainchild. Socialism is a system where the working class holds political and economic power, ending oppression and exploitation. It guarantees a job, health care, housing, education, dignity and respect for the majority who suffer under capitalism now. It is what May Day stands for. In the socialist countries, International Workers Day is a national holiday. Cuba will see a massive rally as workers take the day off to defend their revolution and oppose the U.S. blockade on their country. In China too, workers and farmers will celebrate the achievements of socialism, which has lifted hundreds of millions out of poverty. The Freedom Road Socialist Organization believes that this year’s May Day is enormously significant to workers in the U.S. and around the world. We encourage everyone to attend rallies, marches and events celebrating the achievements of workers, and to fight for a better world!